Me, Jason & David post-race. So first things first: finish time –2:03:44. I wanted to run the race – y’know, NOT race it! I enjoyed EVERY LAST MOMENT. Yes, even the 700 foot climb. I know, cheesy, but this is called America’s Toughest Road Marathon – sure, I did the half, but hey, I think that should mean I am 1/2 way super tough! Why hello, 700 foot climb! Yeah, serious! Have you ever seen splits like this? Haha…I couldn’t believe it myself. But, you know what, it made for a very enjoyable race – see, people were passing me LEFT and RIGHT those two double-digit miles!! I let it go, even smiled and waved. Then, the downhill, I kept it even but in control because it was SOOOO fun flying down the mountain – wheeeeeeeeeee – but I knew my legs would NOT be happy if I opened it up to as fast as my legs could carry me. The Garmin was GREAT because once that mountain portion was over, I kept checking to get in as close to 60-90 seconds over MP as possible until the last mile because I had that fuel to burn at the end. It was AMAZING to pass TONS of people on that last stretch 😉 It was just enough to satisfy my ‘race’ appetite! My only regret in this race was that I didn’t bring a camera to run with. I thought my hands would be too full, but WOW, this course is gorgeous. So much green! 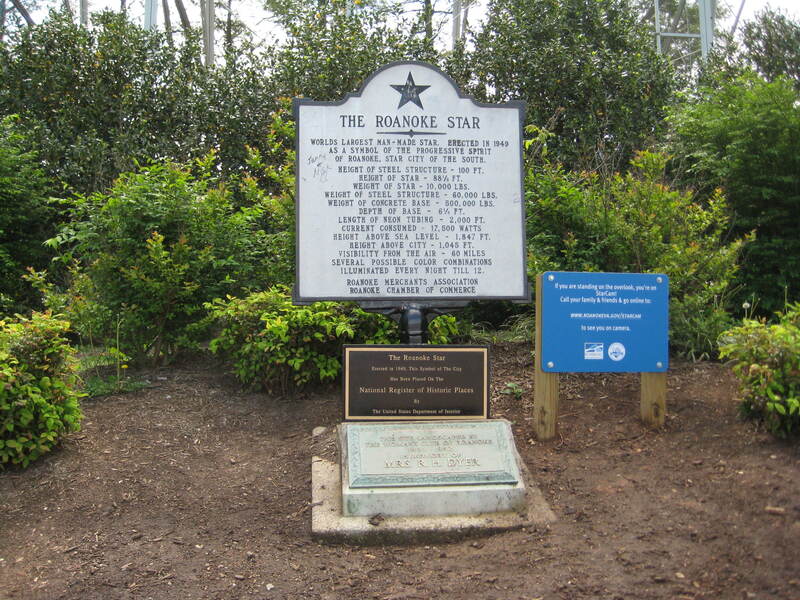 And, I don’t know if YOU knew this, but Roanoke is called “The Star City” because of THIS beauty…. 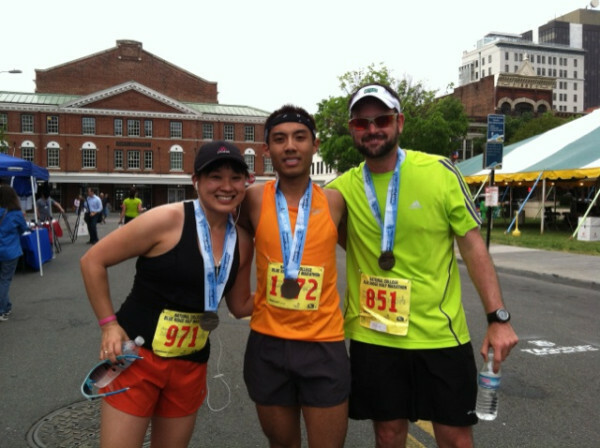 So yeah, funny story – in the race, we ran RIGHT BY where I am standing/posing in the above pic. 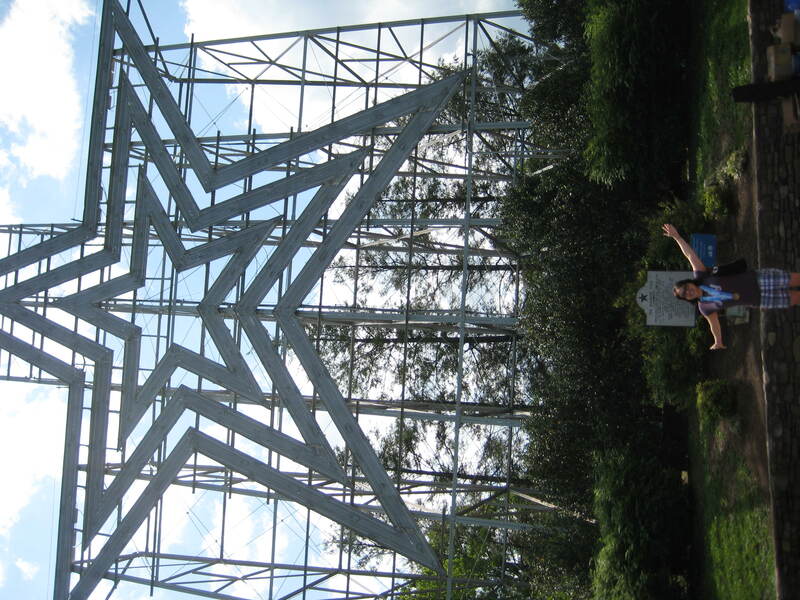 However, it was an aid station before the downhill and I DID NOT EVEN NOTICE that I ran by this GIGANTIC star. Yeah. Don’t try to make me feel better and say it’s not that big, cos, well…. "World's Largest Man-made Star." Truth. Back to the race though – it was amazing. 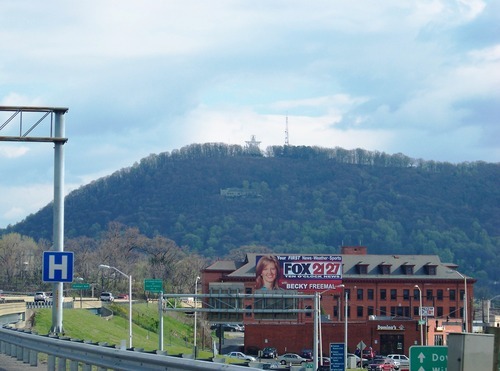 If you ever get the chance to run this event – RUN, don’t walk – wait, yeah, you can walk a little if you need to 😉 – right on down to Roanoke, VA. You won’t regret it! What is your favorite road race? I start sweating just by looking at that elevation profile! Fantastic race, Krissy! Since you’re the sweat engine, you should run this race then! 😉 check out the profile for the FULL! OMG…. It was great! I think you’d like this race, Liz!!! I recently began subscribing to your blog, and you are such an inspiration to me! I am running my first 5K tomorrow and I’m very nervous and excited! Your success and positivity are so encouraging! Holy elevation chart!! I didn’t grasp the significance of “America’s Toughest Road Race” until I saw that pic you shared. Great job!! Thanks so much! It was a really great race! The marathon was even more mountain-y….the winner of the marathon took 3 hours, if that’s any indication of toughness!!! That is one large and in charge hill. I love your attitude and one of these days I will be as wise as you and do the same (I have been saying I want to run a race in a Zen state of mind for years) I will get there! 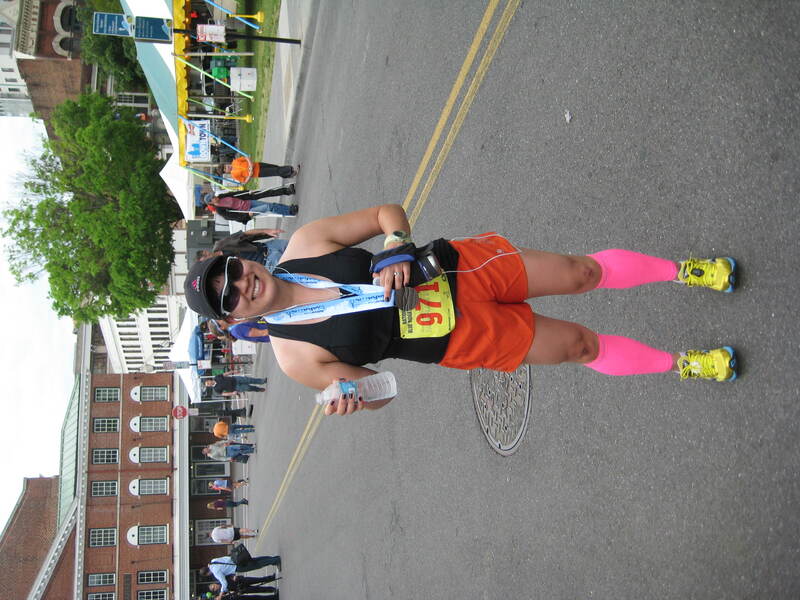 Your time is amazing, you are such a talented runner Krissy. Aw Lisa your comments always warm my heart! Hahah! Best comment, ever. Ironically, when I hit that home stretch near the finish, my iPod started playing New Found Glory’s “Coming Home” which was kind of neat!! Congrats! 700ft climb!!! That’s awesome that you conquered it with a huge smile!! Way to go! Thanks, Meg! It was so awesome. Congrats on your winning (!!) race!!! Sounds like a fun day! There is a mini-mountain near my house that I run occasionally. It’s about 2/3rds of a mile with nothing but up and up and up. I think my dog thought I was never going to make it to the top yesterday. He kept looking back to make sure I was still coming! Aww that is so cute that you run up with your dog and he checks on you!!! Awesome recap – the splits and elevation for this race are so cool. You did an awesome job of closing off the race strong, much better than what I was pulling out! It was great to meet you in person, and I’m so glad you won from my blog, ran it, and instantly fell in love with it. Thank you for tapping me on my shoulder at the beginning. It was fun running that first mile with you! I’m running a half with a somewhat similar profile this weekend (well, it’s probably not nearly as bad in actuality but in my head)… I plan on taking it easy for sure! I love any road race along the ocean. It’s the one type of scenary that really distracts me and gets me into a running zone! Thanks so much! I had tons of fun. What a wonderful recap Krissy! You captured the run quite well. We hope to see you again next year (April 20, 2013). Thanks for stopping by, Pete! I will recommend this race to everyone 😀 If we’re still in the area next year I’d love to run it again!